Streetsblog editors from New York, Washington and Los Angeles have tried to make sense of what happened on Tuesday, and what it means to the livable-streets movement. Much of my family is from Pittsburgh. Like San Francisco, it is a beautiful place, bounded by water, with hills, great, walkable neighborhoods, and bridges. Pennsylvania was a battleground state. One of my best friends from Pittsburgh, Jim, wanted nothing to do with either political party; he didn’t vote for Hillary Clinton. For sure, Donald Trump’s hateful rhetoric brought out the worst in America. But Trump didn’t win on racism and misogyny alone. It’s understandable why many in the rust belt want nothing to do with the political establishment. Pittsburgh was a steel town. Not too long ago, people had good, union jobs and lived in modest, comfortable houses. Over time, however, the steel industry went off to Asia in search of cheap labor. In fairness to Pittsburgh, it has managed to diversify its economy to some extent. But it’s a shell of what it once was. That said, a few years back, an airline advertised a special, direct flight from Pittsburgh to Paris. Jim and his wife had always dreamed of visiting. It was their first trip overseas. He came back gushing about how beautiful it was—and how he wished Pittsburgh was like that, with great public transportation, high-speed rail, walkable, clean boulevards, and people-friendly streets. “If Pittsburgh can be like that, I would pay high taxes!” he exclaimed. At yesterday’s election roundup at SPUR, David Latterman, a political consultant, joked that the Bay Area should build drawbridges and lift them up for the next four years, to cut San Francisco off from the rest of the country. He was joking, but only partially. 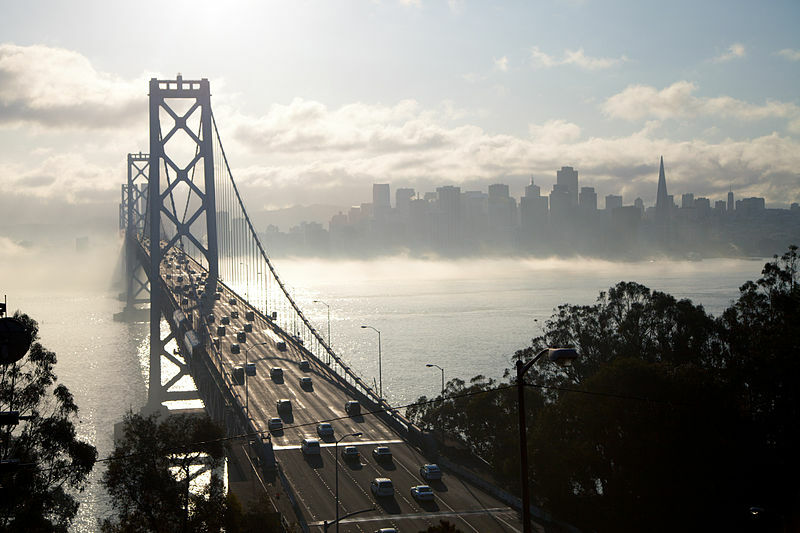 I say the opposite: It is imperative for San Francisco to build more bridges—and tunnels. It’s great that the BART bond passed, but it could have been large enough to start construction of a second Transbay Tube. The BART board was afraid of jeopardizing the two-thirds voter threshold needed for it to pass. More than ever though, we need to find the political will to build that tunnel. We also need a subway under Geary, we need the downtown extension of Caltrain, and we need safe streets with protected bike lanes everywhere. Unfortunately, San Francisco’s Prop. K failed, but maybe it wasn’t ambitious enough. Maybe what we needed was another measure like Proposition A, to go all-in for a plan that includes all the subways a recent survey showed we want. If Oakland managed to pass KK, and Los Angeles passed M, S.F. might have passed another transit tax. But this isn’t just about megaprojects. We need to clean up litter. We need places for the homeless to live in health and safety. We need to fix our streets and make them as walkable and bikeable as possible. In other words, we have to redouble our efforts to make San Francisco, Oakland, and the entire Bay Area into the best, most sustainable, most livable region the world has ever known. When people come to visit, they should see beautiful, inviting spaces. Transit should be reliable, fast, and clean. We need employees who treat tourists and regular riders as honored guests. Then let’s make it cheap–or sometimes even free through a grant program–for kids from schools in other states to come here to study. Set up exchange programs, just like nations do, so they see our great city, enjoy the results of our work, and go back to cities and towns in Nevada, and Ohio, and Pennsylvania, and other battleground states. Word will get around that not only is the Bay Area beautiful, and cool, and fun, and clean, and tolerant, and safe–but it’s how every region could aspire to be. In other words, focus on making our region a model for America and our progressive values may rub off too. Because you don’t change a country by raising bridges–you do it by building them. When BART next goes for any bonds, they should be county by county. IINM CC Cty voted 59 % for RR just as they did decades ago for BART’s original founding. (in that case the threshold was 60 and the votes were averaged across Alameda, SF and CC to make 60.1). If they are still not supportive, and refuse to underwrite future improvements, then they should not see improvements in their area. The litter is the easy part. Just don’t drop it and when you see it on the sidewalk in front of your house pick it up. Have pride in place. But a second tube under the Bay would benefit BART riders from every county. I am all in favor of a second tube. My point was if the CC Cty citizens don’t want to pay for maintenance, slow orders and less frequent, shorter trains should be the response. I know this sounds harsh, but CC Cty residents, and the CoCoTimes (now East Bay Times) have regularly campaigned against funding BART as if we should just pave Oakland and build extra bay bridges. Maybe if their schools still assigned John Donne they wouldn’t be so lame. Thank you for this piece. This is a time when cities like San Francisco need to reflect on their views of what we consider the “other.” How many of us have disregarded “flyover states” and “rednecks”? How many of us have treated this wonderful region like a private club– one that we got in but refuse to let others enjoy. I believe it is the moral responsibility of an open society– especially in the face of a closing one– to extend those rights, privileges, and lifestyles to all people. We might hate the people in power in states like Indiana and North Carolina, and we may think the solution is to cut them off, but there are still millions of vulnerable People of Color, queer people, trans people, Latinx, immigrants, Muslims that can’t escape for one reason or another. This is not the time to abandon the “others”, but demonstrate openness and cohesion and model an open society for all to see. Thank you again… let’s build more bridges and tunnels; both metaphorically and physically. But by 2012 massively subsidized Amtrak was competing with other massively subsidized forms of transport. East Bay Times has campaigned to try and steer Bart to a proper path, rather than throw money at an off kilter ship. Blind faith isn’t the way to improve transit. One of these contenders is bound for the Final Four of sorry bus stops.